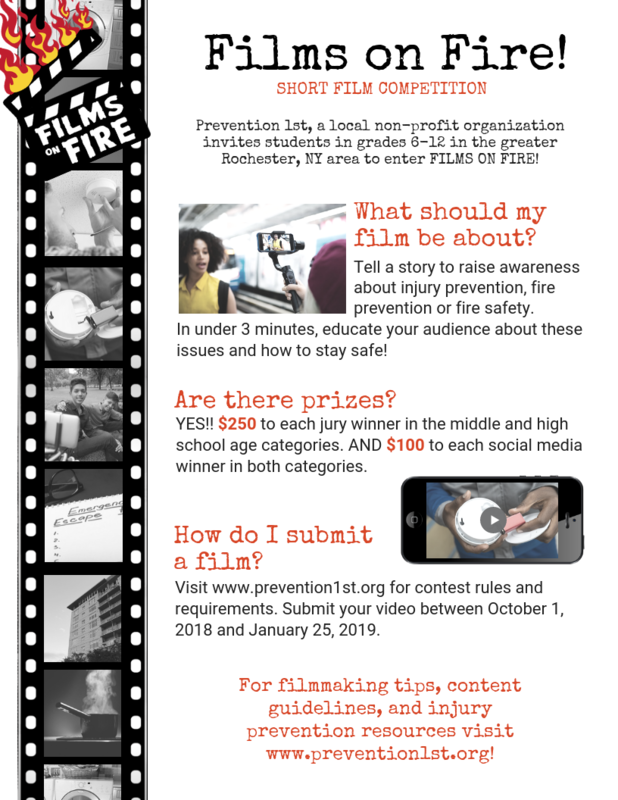 Rochester-area non-profit Prevention 1st is kicking off Fire Prevention Month on Monday by opening “Films on Fire!,” a short film competition encouraging local middle and high school students to create entertaining and educational videos to teach young people about fire safety. The contest, which has a poster component for elementary school students, will be judged by local filmmakers and community leaders in February, with cash prizes going to the winners in each category. “With the recent news that New York State is second in the nation for the most deadly house fires, it’s more important than ever to make sure every member of the family knows how to prevent fires, but also what to do in the event they break out,” said retired RFD Lieutenant and Prevention 1st Vice President Robert Crandall. Interested young people and those who work with them are encouraged to visit www.prevention1st.org/fof2019 to find out the details and requirements for the contest. Included are content suggestions, so that students focus on the key messages that are most important for people to remember around fire safety. Of particular interest to young people may be the cash prize of $100 each for the winner of the middle school and high school “social media” category for students whose videos get the most “likes” on Facebook, YouTube or other sites. The winning videos judged by the contest panel will each win $250. See attached flyer for both the video contest and poster contest. Please share! Lt. Crandall (cell 748-6331) and Prevention 1st President Molly Clifford (cell 233-3699) will be available for comment any time during the week of October 1. “Safe at home.” It’s how we feel when we close the door behind us at the end of a long day. But how often do we take a moment to make sure we truly are as safe as we feel in our own homes? Preventable injuries — including home fires and burns, household poisons, drowning and falls — are the leading cause of death for children, teens and young adults (you’ll be glad to know “young” means up to age 44). They’re one of the leading causes of death for older adults too. Let’s say you’re not afraid of dying. Why take the time to be safer? You have better places to spend time than the emergency department. Injuries account for more than a third of all emergency department visits. The average wait time in EDs across the country is four hours and seven minutes, according to the engrossing reading of a recent Emergency Department Pulse Report. What would you rather do with those four hours? Safer is cheaper. Injuries cost the nation $80 billion every year in medical costs alone. The estimated lifetime cost of injuries occurring in a single year in the U.S is more than $406 billion. No matter how good your health insurance is, an injury can take hundreds or thousands of dollars straight out of your pocket. You want to get on with your life. A broken hip from a fall that could have been prevented may keep you from enjoying your normal activities for months. And do you really want to spend Rochester’s brief summer in the rehab center? Wipe up a spill right away. Falls are the leading causeof nonfatal unintentional injuries for every age group, except 10 to 24 year olds—and for them it’s the second leading cause! Wiping up spills is one of several simple ways to prevent falls. Play Help Mikey Make It Out with your kids. This fun, interactive game at www.homefiredrill.org teaches life-saving home escape lessons. Plan and practice your home escape. Working smoke alarms and CO detectors save lives, but does everyone in your home know what to do when they sound–especially in the middle of the night? Does everyone know your meeting place outside, where you can find each other and firefighters can find you? Visit www.homefiredrill.org. Check the manufacturers instructions to see if you should replace your CO detector. New York State law requires CO detectors to be installed in all new and existing homes having any fuel-burning appliance or attached garage. But you need a new detector every two to 10 years, depending on the model. Carbon monoxide kills in minutes, and unlike smoke from a fire it’s colorless, tasteless and odorless. It can be created by open flames, space heaters, water heaters, blocked chimneys or running a car inside a garage (even with the door open). If you have only one carbon monoxide detector, the Consumer Product Safety Commission recommends it be located near the sleeping area, where it can wake you. Be sure it’s properly installed, complying with manufacturer recommendations and local codes for installation and use. Make sure your stove has at least 36 inches clearance from anything that can burn, and proper floor support. Wood stoves should be burned hot twice a day for 15-30 minutes to reduce the amount of creosote buildup. Burn only the materials for which your stove is designed. Never burn charcoal indoors. Burning charcoal can give off lethal amounts of carbon monoxide. 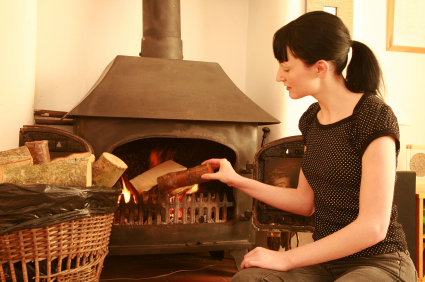 Remember, wood stoves and pellet stoves are designed for heating. Cooking stoves should never be used for heating. Learn more about wood and pellet heating, including safe installation and maintenance, from the Department of Energy. It’s important to keep getting out these basic fire safety messages. Because, people still just don’t get it. And ignorance can be deadly. Several surveys over recent years continue to find that 80%-90% of Americans feel safer from fires at home than in a public building, or feel equally safe in both locations. Unfortunately, they couldn’t be more wrong. Nearly four times as many fires occur in residences as in non-residences, and they are far more deadly. 85% of all US fire deaths happen in homes. 39 times more likely than dying in a hurricane or tornado. Perhaps the false sense of being safe from fire at home explains why only 18% of survey respondents said they worry about the dangers of fire more than once a year. If we can get people to think about fire safety at least twice a year, it will be a huge leap forward! Of course, we don’t just want them to worry. We want them to take action. We need to first raise their awareness of vulnerability, then let them know there are simple actions they can take to reduce their risk. At www.homefiredrill.org, you can print off copies of our Home Fire Drill reminder sign: “Change Your Clock, Check Your Alarms, Practice Your Home Fire Drill, Alarm Goes Off You Get Out.” You can get and share step-by-step instructions for planning and practicing a home fire drill, and for choosing, installing and testing smoke alarms. You can view (and share the links to) the video Home Fire Drill: Does Your Family Know What to Do? and the interactive learning game Help Mikey Make It Out. You don’t even have to wait for the Daylight Saving Time change. © Prevention 1st, www.prevention1st.org. May be reprinted with copyright and contact information intact. Halloween frights should be fun, not painful. Avoiding a scary visit to the hospital is simple, but requires some forethought. Use flashlights, and reflective tape on bags and costumes, to be more visible. Avoid darting from house to house. Stay on the sidewalk and cross at corners. If there’ s no sidewalk, walk facing traffic. Choose soft, flexible props when possible. If a costume calls for swords, cane, or sticks, they should not be sharp, or too long (to avoid falls). Try a glow stick instead of a candle in jack o’lanterns. Keep candlelit jack o’lanterns, and any candles, away from curtains and other flammable objects. Never leave them unattended.